If you book a night at one of our Prestwick airport hotels we think youll be pleased when you find out just how little it could cost you. Comfortable and well furnished rooms are surprisingly affordable, so why not book with us today and start your holiday feeling refreshed. Why is it a good idea to pre-book? We always say that it is a good idea to book your hotel stay as soon as you have booked your holiday. Youll have your pick of all our services before they get booked up and whats more, youll get them at the lowest prices. Once youve booked you can sit back and enjoy the start of your holiday free of the stress of finding a room last minute. Weve made booking really easy and youve got two choices: you can book via our simple website or if you want to discuss your booking with us then call our award winning contact centre and we will be happy to help. Which cheap hotels are available at Prestwick airport? 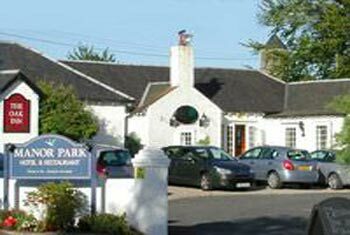 At Prestwick airport we offer the wonderful Manor Park Hotel. Its a 3-star hotel that boasts a friendly atmosphere and exceptionally comfortable rooms. The real draw of this hotel lies not in its proximity to the airport but in its stunning location in amongst picturesque woodland surroundings. Its the perfect place to lose yourself to tranquillity before your flight. Relax with a drink in front of the fire in the lounge area, or dine in the magnificent Maizie's bistro for a sumptuous meal. The restaurant offers both traditional Scottish meals and international cuisine. If youre bringing your car you could actually save money by booking a hotel stay with parking rather than just booking parking alone, check out our website for prices and availability. Mastercard have taken the worry out of money matters on holiday. Their FairFX currency card works just like a debit card but you top it up with your chosen currency. This card removes the hassle of carrying foreign currency and dealing with exchange bureaus. There are also no transaction fees unlike most debit and credit cards, and with chip and pin you get extra peace of mind. We think its such a good idea that we offer an option to include a FairFX card when you book, just check the added options on our website when you come to make a booking.